Bollywood generally refers to Indian Film Industry. But in more accurate form it is the Hindi film industry based in Mumbai. Bollywood is the combination of two words “Bombay” (Mumbai was formally known as Bombay) and “Hollywood”. 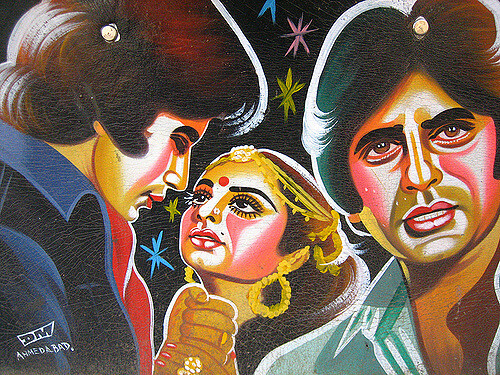 Bollywood is one of the largest film producers in the world. Around 200-300 films are produced each year. Which earns around 3000-4000 crores each year. The first film made in India was the Raja Harishchandra (1913). It was a silent movie. The film was made by Dadasaheb Phalke. He is also called the Father of Indian Cinema. The first talkie of Indian Cinema was Alam Ara (1931). The era 1940-1960 is regarded as the Golden era of Bollywood. In this period several critically hit films were made. Some them are- Awaara (1951), Aan (1952), Pyaasa (1957), Mother India (1957), Madhumati (1958), Kaagaz Ke Phool (1959). The first color film of India was Kisan Kanya. It was made in 1937. But the trend of color cinema started during the 1950. Bollywood movies are famous for its songs and dances. They are part of Indian films from the beginning of Talkies. The first Talkie Alam Ara had seven songs. Dadasaheb Phalke award is the highest award of Indian Film Industry. Other prestigious awards are National Awards, Film fare awards. Dadasaheb phalke award was first awarded to Devika Rani in 1969. Dilwale Dulhaniya Le Jayenge is the longest running film of the world. It ran for about 1000 weeks. The longest movie of Bollywood is “Gangs of Wasseypur”. It was realased as single film in cannes film festival. It is about 319 minutes long. Lagaan was the first film which was released in China. First Indian cinema to get Palme d'Or at Cannes Film Festival was Neecha Nagar. It was released in 1946. Mother India was the first Indian movie which got Oscar Nomination for Best Foreign Language Film.